Guwahati: Around 52% of people in the so-called mainland India have a negative perception towards the Northeast, while 87% professionals are ignorant of the states in the region. Both of these and many more of their ilk can be considered as omens for the wellbeing of the region that has been paying the price in m any ways. Such factors have much to do with matters like the hostile treatment that the people from the region, mostly students, are meted out at New Delhi and other metropolitan cities in the country. 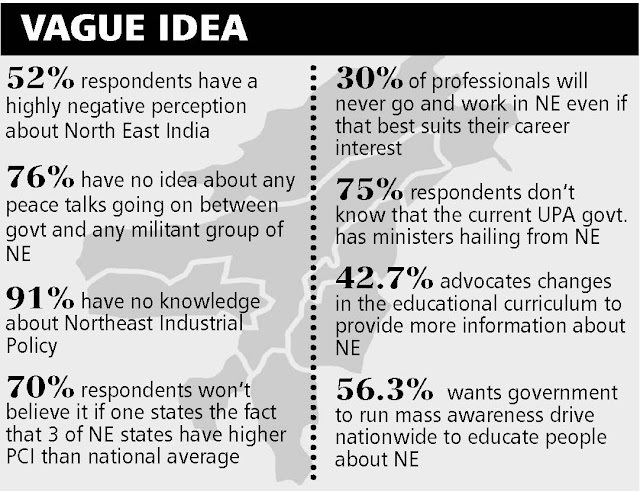 A survey conducted by a New Delhi-based organisation — North East India Image Managers (NEIim) — has revealed that 52% of people have a negative perception towards the Northeast, while 87% professionals even do not know of the states in the region. “Their immediate recall of NE India is that of a region riddled with insurgency, and most unsafe place in the country or most underdeveloped region with hardly any modern infrastructure and poor connectivity with the rest of the country or people with Mongoloid features and weird food habit and an alien culture,” Trideep Lahkar, a core-committee member of NEIim, said. Even though peace talks between the insurgent groups and the Centre are hot topics in the media, as many as 76% of the respondents have no idea about any peace talks. “The findings of the survey indicate that due to the negative imagery that people have about the region even if they are given the best of job offer and it suits their career interests best 30% of them will never work in the Northeast, while 52 per cent are not sure if it’s a good idea t o go and work there,” Trideep said quoting the survey report. Even if 71% of the respondents agree that the place is full of natural beauty, as many as 30% of them may not go on a vacation to the Northeast. “This testifies the fact that the picture has not really changed over the years. The stories of progress and peace from the Northeast have not reached the people in the rest of the country as yet,” he added. While 70% of the respondents can’t believe the fact that three Northeast states have per capita income more than India’s national per capita income, 91% don’t not know of the Centre’s Northeast Industrial Policy that gives special incentives for investments made in the region. What is even more surprising is that 75% respondents don’t know whether the current UPA government at the Centre has any minister representing any constituency of the Northeast India, while 56% of the respondents don’t even know that there is an IIT, an IIM and Central universities in the Northeast. “This speaks about the failu re of the governments — both at the Centre as well as in the states to actually create awareness in the country. There is definite need to create communication programmes which break the myths about the region create a positive mindset among the common people,” said another member of the organisation. 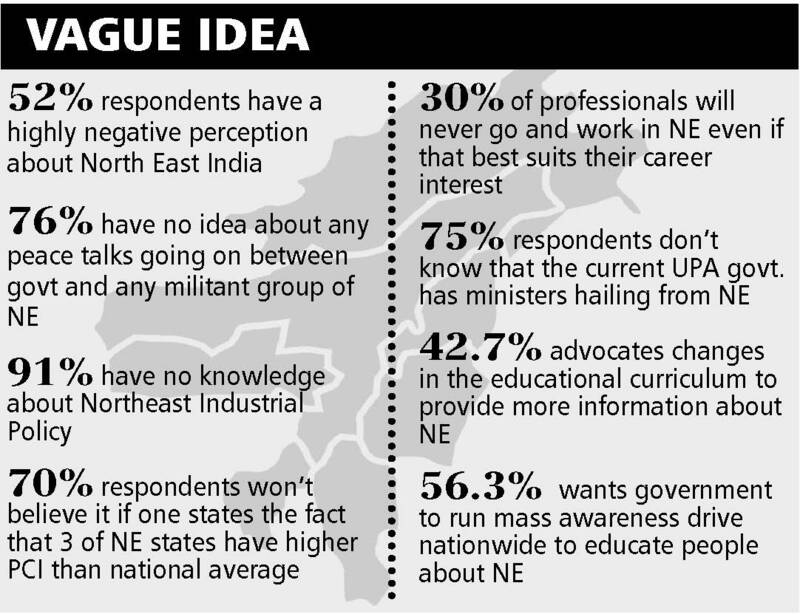 The study, interim findings of which were released by NEIiM on Thursday, goes on to probe as to how such a hiatus of knowledge was created and how to undo it, 56.3% respondents said that the government should run special awareness campaigns using various media tools at national level to educate people about North East India. A sizeable 42.7% also advocate for changes in school and college curricula so that the children may know more about the Northeast India. When the study further probed as to why they failed to have much information on Northeast India, a startling 61% said that they do not see much of the Northeast India on national media. The perceived notion that people from the Northeast India don’t mingle with others stand challenged as 51.6% of the respondents said that they have started knowing whatever little about the culture and people of the Northeast from their interaction with colleagues or friends from Northeast India.